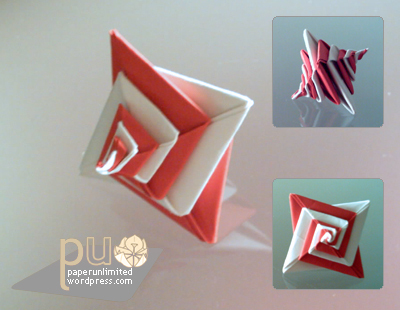 These spirals belong to modular origami simply because each one of them are made from 4 units. The red and white one is called 両面ぐるぐる/ double faced spiral. The light pink and light purple one is 川崎式両面ぐるぐる/ Kawasaki style double faced spiral. Actually if I understood correctly Kawasaki’s version is only made with 2 units thus being plane on one side. I actually haven’t tried that yet, key word being yet! This lovely spirals were made with copy paper and squares of 8 cm, therefor they’re thicker than they should. Both diagrams came from FUSE Tomoko‘s book らせんを折ろう wich translates as “Let’s fold spirals”. This book is divided in two: らせんの冒険, spiral aventure, containg mostly shells and a dna spiral and 川崎式らせん折り, Kawasaki style folded spirals, my favorite :) it has lots of boxes, cubes, cuboctahedrons, some shells and these spirals. I have more things folded from this book (some boxes, cubes and cuboctahedrons) so they’ll eventually show up in the blog. 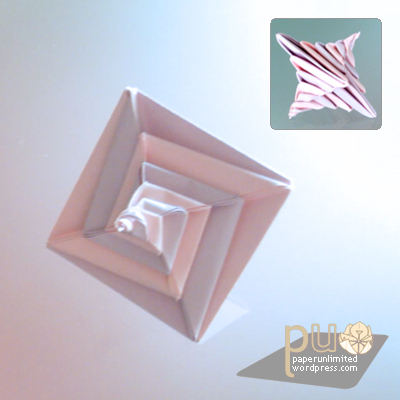 This entry was posted on 2007|02|02 at 16:44 and is filed under modular origami, origami. You can follow any responses to this entry through the RSS 2.0 feed. You can leave a response, or trackback from your own site. These are really nice and I’ve folded a lot of these spirals like the red and white one but the other spiral (the light pink and purple one) is the one that I’m having trouble figuring out (and I don’t have the book) I’ve noticed that it’s diferent its shaped like a square unlike the red and white one which has more of a 4-pointed shape– anyway i’ve been searchin ALL OVER the net for a diagram or something that could help me to figure out how to make that Kawasaki style one but no luck there i was REALLY trying to figure out how to make the spiral faced cube and I think (from what i’ve seen) that you need to know how to fold this Kawasaki style spiral to piece together the cube — are the units for the Kawasaki spiral the same as the regular spiral (the red and white one) If you can PLEASE, PLEASE (it would be most appreciated) e-mail me Thanks!